Congratulations to the Wexford participants who completed the Institute of Technology Carlow Certificate in Restorative Practices on July 28th 2017 in New Ross. The Certificate in Restorative Practices is a new 10 credit Level 8 module which Institute of Technology Carlow developed and then launched in partnership with the local Wexford Restorative Practices Partnership. 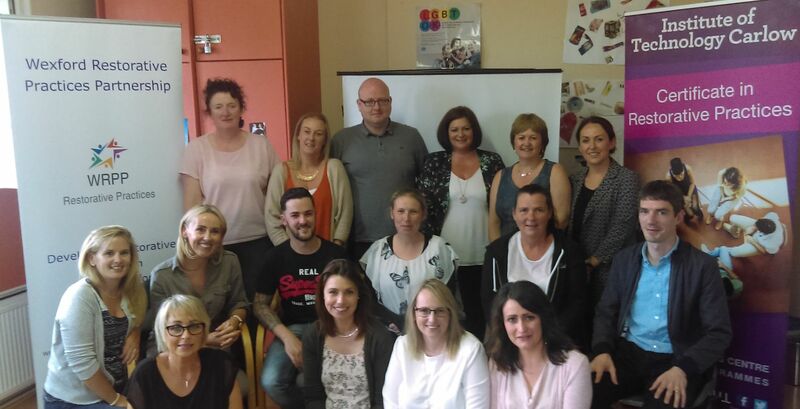 This course enabled professionals from across Co. Wexford to develop their knowledge and skills regarding Restorative Practice and design ways to imbed elements of it in their practice. The programme was facilitated over the summer months in Youth New Ross premises located in The Bullawn, New Ross. For more information on the next intake for the programme, visit https://www.itcarlow.ie/study/lifelong-learning.htm or contact 053-9185808.